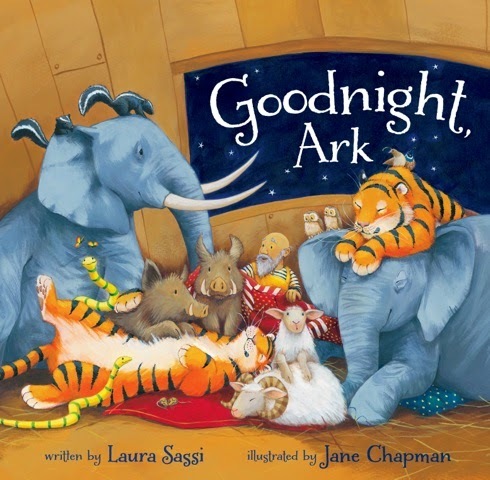 Perfect Picture Book Friday – Goodnight, Ark PLUS A Giveaway!!! Dzoo dzoo-doo dzoo dzoo dzoo dzooooo!!! Welcome back to another year of Perfect Picture Book Fridays! I am so looking forward to all the new picture books we’re going to share! I am thrilled to be presenting a wonderful book for the 2014-2015 PPBF kick-off, written by none other than your friend and mine, Laura Sassi. 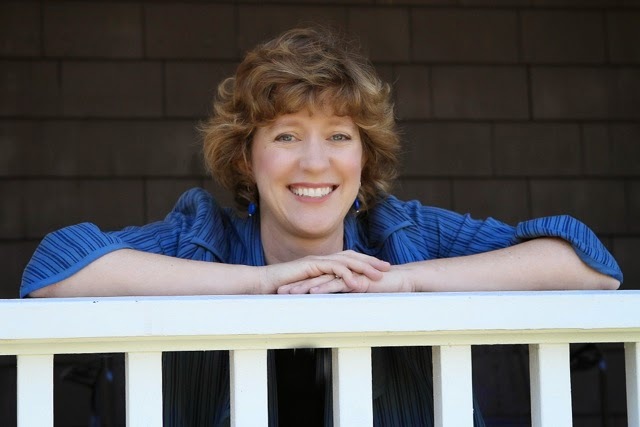 Since this is part of her blog tour, we are fortunate to have her here with us today, sharing her thoughts on the illustrations and how parents and teachers can engage their kids through them. She and her publisher, Zonderkidz, are also generously offering a giveaway, so one lucky reader will win a copy of this delightful book! (U.S. residents only – street address, no P.O. box – publisher’s stipulation.) Laura’s thoughts and the giveaway will appear below the book listing. Brief Synopsis: Two by two, the animals board Noah’s ark. They’re supposed to settle down and go to sleep… but the heavy rain, thunder and lightning frighten them, so two by two they climb in bed with Noah! How much can one bed take? And will anybody get any sleep? One of the basic rules of picture book writing is that writers need to let the illustrations tell part of the story. I understood this in principle, but it wasn’t until I saw Jane Chapman’s delightful illustrations for GOODNIGHT, ARK that it really hit home. I mean, WOW! Her illustrations truly show that principle in action and are a great reminder for me, that as a writer, I should curb any lingering tendency to over-describe or over-prescribe my texts and let the illustrators do their jobs. 1.Extra Animals: In addition to the key players, Jane adds extra animal guests. I found nine extra pairs. Can you? 2. Extra (funny! )provisions: The text makes no mention of specific provisions, leaving lots of room for Jane to add humorous extras like the canned cat food that rolls across the floor on the tippiest page in the story. It took me several reads to notice them! What other funny provisions do you see? 3. Underwear! : Every child I’ve read my story to has howled at Jane’s humorous inclusion of polka-dotted boxers quietly hanging on the line to dry. We’ve also chuckled over the toothbrush. Both nice touches, I would never have thought of. What other humorous extras can you find? 4. Extra Plot Layer: I don’t want to give away the most exciting part, but a certain pair of creatures is instrumental in restoring balance on the ark. In her illustrations, Jane brings out the personality of this pair in a darling way, even hinting through their gestures that they planned the whole stinky thing. I LOVE that extra layering! Thanks, Laura! To see the other stops on Laura’s blog tour (6 completed, 4 upcoming) please click HERE for the links. Please leave your comment by Sunday September 14 at 5 PM EDT. A winner will be chosen at random and announced next week. One note: the publisher stipulates that the winner must reside in the U.S. and have a street address, not a PO box, so please let us know if you’re commenting just for fun and are not eligible. PPBF bloggers please be sure to leave your post-specific link in the list below so we can all come visit you! Hurray! Can’t wait!! Would You Read It Wednesday #144 – Cleo And Pinkie (PB) PLUS The July Pitch Winner PLUS Straight From The Editor x2! It's very cute, Kristi! I hope you'll get a chance to see it! Isn't it funny how particular we are when it comes to sleeping arrangements? I had a whole crew of stuffed animals I wouldn't sleep without. And My step-daughter used to have a rotating system so each of hers got a turn to sleep next to her 🙂 No worries about the link-up! We need readers just as much as reviewers, and we all know there are only so many hours in the day! You're welcome, Barb! Hope you get a chance to see the actual book – it's charming! I know, Teresa! I love hearing those how-the-book-came-to-be stories too! We promise not to tell you son you told 🙂 And I could tell you a similar story, but I might get in trouble since my kids occasionally come over here and read 🙂 Have a great weekend! Catherine! You're commenting! How did you manage! Yay! I'm sorry you can't be in the giveaway (not my rules 😦 ), but I hope you get to see the book because it's so cute! This book looks wonderful – thanks for the peek at it, Susanna. I don't know if I have a funny story about bedtime… but one “fun” thing we started when my daughter was three or four was telling “fairy stories.” Basically, I'd lie in bed with her and make up lots of stories about the adventures my daughter would get into, often featuring fairies or squirrels or another animal. Sometimes I'd tell them, but often I'd encourage my daughter to make one up. She's 10 now, and still asks for “fairy stories” once in a while. Tonight's bear hunt: the Winnies turned up in the pantry next to the syrup. Go figure. I've been following this book tour and it's on my list. I look forward to getting my hand on a copy. Thanks for sharing and so happy MPBM is back! Looking forward to reading through the list and the adding more great reads to my library list. This sounds like a wonderful book! I imagine it was hard for all the animals to get comfortable on the ark, especially the first night. My husband used to make up Johnny stories for our daughter when she went to bed. I wish I had sat outside her room with a tape player recording them. When I tucked her in she wanted the night she was born story. I guess I should be grateful that she either phones us or texts us goodnight now that she is off in college. Thanks again, for having me, Susanna! I love how these wonderful bedtime routine stories keep rolling in. It was especially difficult for them to get comfortable in Noah's bed 🙂 And thanks so much for sharing your bedtime story. I was telling Laura above that it reminded me of my dad telling made up stories to me and my sister, and oh how I wish I had those! I like a new take on the old story that Laura Sassi's written. My bedtime routine is partially borrowed from Love You Forever by Robert Munsch. I made a tune to go with, “I love you forever, I'll like you for always, as long as I'm living, my baby you'll be.” I still sing it each night. Glad you liked it, Tracy! It's such a cute book!